A couple months ago I had my first craft fair. I worked my fingers to the bone for months drawing, crafting lots of cuties stuff (I'll share more on that in another post). Last minute my husband drew a mullet edition Don't Eat Pete. I edited it on the computer and that night we stayed up late laughing hysterically. We kept going back and forth, it was either going to be the best seller in my booth or it was going to be an embarrassment and would ruin our good name. We were in tear laughing so hard. What happened you ask? Mullet Edition Don't Eat Pete outsold my sweet and cute Don't Eat Pete version 10 to 1. It was actually my top seller in my booth. So yes, the average person has a more morbid sense of humor than he or she lets on. 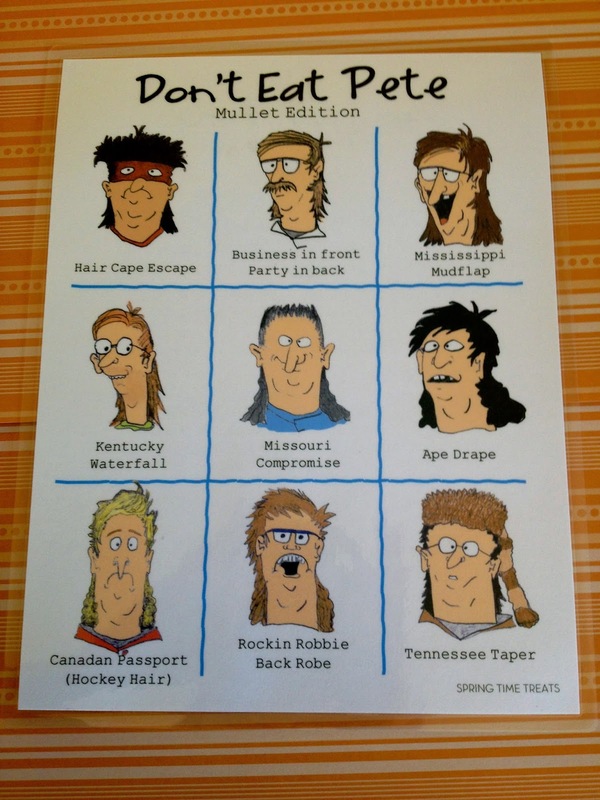 After many request we have listed Don't Eat Pete Mullet Edition on etsy here. It's an 8X10 digital print. Only $2.00 Oh ya!